The graphics card space is not a fun place to operate in. The two competing GPU makers take a huge cut of each card sold while the manufacturer has to make do with dwindling margins. So each graphics card vendor will find new ways of trying to squeeze a bit of extra cash out of their customers by coming up with something a bit different. 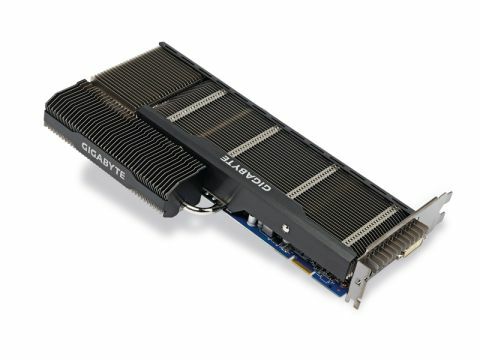 The passively-cooled Gigabyte Radeon HD 5770 SiIent Cell is a prime example. The standard, stock-clocked, vanilla HD 5770 now comes in around £100, but find a niche, sling a custom cooler on it and Gigabyte can ask an extra £45 for the privilege. To be fair, having such a well-performing card operating without the need for active cooling is impressive, as is the (necessary) scale of said cooler. The damned thing is huge, with more fins than you'll find in an aquarium in Helsinki. On a busy bank holiday. As to whether it's effective enough to reasonably run the HD 5770 is up for debate. It's true we were running the card in an open test-bench where the airflow across the card isn't as great as in a well-cooled, closed chassis, but still the card regularly hit the horrific 100C mark. Still, it didn't throttle back at all and managed to garner the same benchmark scores as its actively cooled brethren. The question remains though: why do you specifically need a passively-cooled graphics card? I understand the need in media centre machines, but this is anything but designed for those small form factor rigs. With the size of the thing and the amount of airflow required to keep it honest, you'll need a full-sized case for sure. You've got to really want a silent graphics card to fork out an extra £45 over the standard HD 5770, especially when, for the same price, you could pick up an actively-cooled, though still pretty quiet, GTX 460 in 1GB trim. It's going to have to be a very good reason to trade off the performance gains from the Nvidia card. Unfortunately then, it's got a very niche market to aim at and, in my opinion, an unnecessary one.